The property of magnet to attract or repel other substance is known as Magnetism. We know that, there exist an imaginary magnetic field lines around a magnet which is the main source, responsible for the behaviour of the magnets. When these magnetic field lines penetrates through an area perpendicularly, then (The average of the magnetic field lines) X (the area through which it penetrates) is known as Magnetic Flux. Gauss law in magnetism states that the magnetic flux through any closed surface is zero. Coulomb stated that “The magnitude of electrostatic force of interaction between two point charges is directly proportional to the scalar multiplication of the magnitude of charges and inversely proportional to the square of the distance between them”. This law is known as Coulomb’s Law. A charge particle is always surrounded by a field in which other charge particles can experience its force. 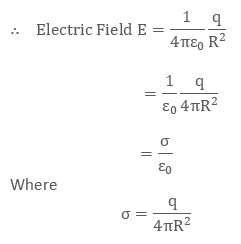 In other words, the region where a charge particle can exert force on other charge particle is known as Electric Field. It is a vector quantity which means that it has both magnitude as well as direction. For a positive charge the line of force is directed outwards while for a negative charge the lines of force is directed inwards. Theorem: Gauss’s Law states that “The net electric flux through any closed surface is equal to 1/  times the net electric charge within that closed surface (or imaginary Gaussian surface)”. Fig 1.1(Here the imaginary closed Gaussian surface is considered to be a circle). Let us consider a long linear wire of length L with uniformly distributed positive charge λ. Where r is the perpendicular distance from the charged wire. A) Electric field due to thin infinite plane sheet with uniform surface charge density. In case of an infinite sheet charge, a cylindrical Gaussian surface is considered, such that the electric field is perpendicular to the surface. As a result of which only the ends of the Gaussian surface will constitute the magnetic flux. B) Electric field due to two parallel sheets of equal and opposite charge at any point. Let us assume that the two parallel plates with equal and opposite charge, is at equilibrium which means that the field is perpendicular to the surface and have zero electric field inside the conductor.Then by applying gauss law we can find the electric field between the two plates, which is given in the below diagram. Let us consider a sphere of radius R with positive charge (q) distributed uniformly all over the surface.To calculate the electric field on the surface of the shell(inside and outside), a spherical Gaussian surface is taken into consideration. Since all the charge lies outside the Gaussian surface therefore the net charge is zero. Therefore  the electric field is zero at all points inside the shell. is the surface charge density on the shell. From the above observation it is seen that the electric field inside the shell is zero and electric field is maximum at the surface of the shell. This is known as Biot- Savarts Law. Where S is any closed surface. 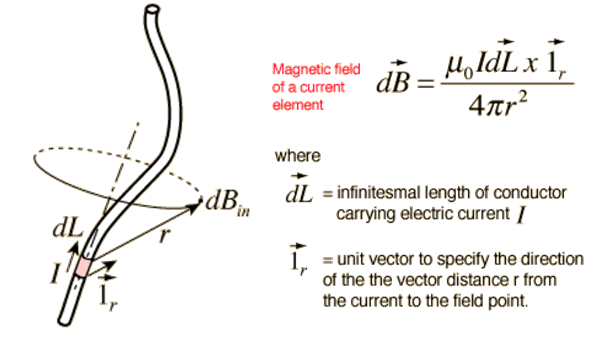 While the gauss theorem strictly deals with the electric field lines, Amperes law deals with the magnetic field lines. Ampere’s law states that the line integral of magnetic field along a closed hypothetical loop (an amperian loop) is equal to μ times the current enclosed by loop where μ is the permeability of the free space. Both ampere’s law and Biot-Savart’s law help us to calculate the magnitude of magnetic field lines but the basic difference between the biot-savart law and amperes law is that in ampere’s law a symmetric amperian loop is considered along a straight line charge. In other words amperes law is used for symmetrical distribution of currents, while Biotsavart’s law is used for both symmetrical and asymmetrical distribution of currents. Q1. What is electromagnetism in physics? Q2. What is gauss law of Magnetism? Q4. Do magnetic lines always form closed loops? Sol. Yes, Magnetic lines always form closed loops. Field line always start from the north pole and ends in the south pole. The magnetic field lines are stronger near the poles. Q5. What is gauss law? Sol. Gauss’s law states that “The net electric flux through any closed surface is equal to 1/  times the net electric charge within that closed surface (or imaginary Gaussian surface)”.